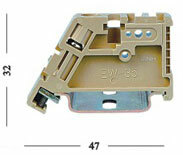 Reasonable installing design,strong versatility, SAK tpe can be mounted on the DIN Rail of G and OM35 type. Small volume,full specificatipn,series JXB's big current terminal use reinforced accessories to install steel pressing-wire frame and wire diversion board technology in order to guarantee the the contact reliable . The stand uses creamed-yellow and grey color, the connecting-ground pedestal uses yellow and green color with more modern sense.